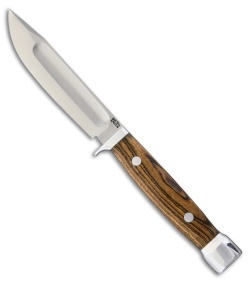 This Canoe fixed blade features an A-2 tool steel blade and a Bocote Wood handle. The Bark River Canoe is a unique knife inspired by the original canoe knife made by Marbles from 1903 to 1922. This knife has a full-tang handle for added durability, and allowed Bark River to address the handle length issue of the original. The Canoe improves upon the historical pattern for efficient use in our modern day. Light, fast in hand, and razor sharp—the Canoe is geared to provide a lifetime of service. Includes a handmade leather sheath for convenient carry.